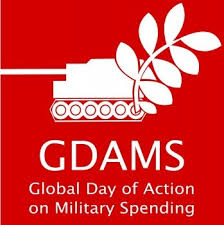 The Global Day of Action on Military Spending (GDAMS) takes place every year in mid-April. 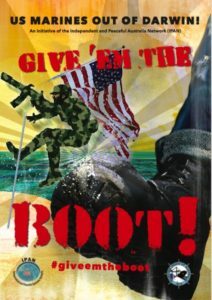 This day of action was originally proposed by the International Peace Bureau (IPB) and the Institute for Policy Studies (IPS) with the primary goal of promoting a general awareness of the vast amounts of public money spent on the military. 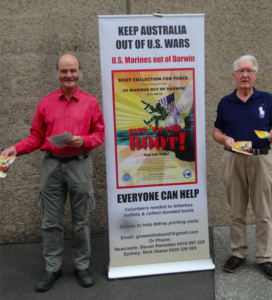 MPG has joined the Independent and Peaceful Australia Network (IPAN) in a campaign aimed at ousting the US marines from Darwin. 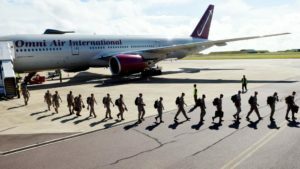 Up to 2,500 US marines are arriving in Darwin during April. Under an agreement that will last until 2040, the marines are here ‘on rotation’ every year. The reasons for this extraordinary deployment have never been made clear and opponents argue that, rather than making the nation safer, they increase to likelihood of some future attack. MPG has been letter-boxing in Sydney and Newcastle, asking people to donate old boots and shoes that will later be ‘given’ to the Australian authorities. Peace activists are demanding that the ‘Force Posture Agreement’ between the US and Australian governments be terminated. The campaign in NSW is being led by Nick Deane and Bevan Ramsden. 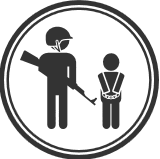 It is reported that approximately 500-700 Palestinian children are arrested and prosecuted in the Israeli Military Court System every year. Members of MPG attended the Cenotaph in Martin Place for the Remembrance Day service on November 11, 2017. 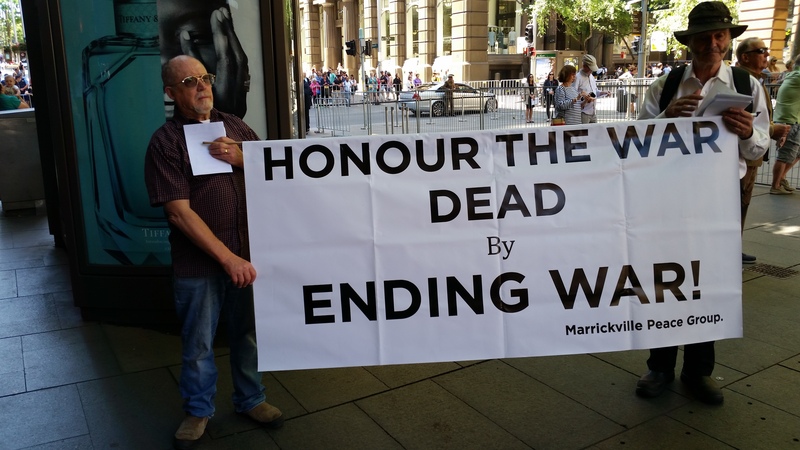 They displayed a banner saying ‘Honour the War Dead by Ending War!’ and distributed a flyer to explain why they were there. There was a generally positive response, but some of the military community clearly resented our presence and our message. Another photo. MPG has written to Sen. Marise Payne, Minister for Defence, again on the topic of the US marines that are routinely stationed in Darwin. The letter argues that the strategic reasons that the Australian government has given for the deployment are not sufficient to justify this development. It argues that hosting the armed forces of a foreign country represents an extraordinary departure from what has happened in the recent past – requiring a special explanation. The full text of the letter can be read here. On March 29, 2018, MPG wrote to the Minister again asking what assurance the Australian government has that the US marines would not engage in military action on orders from Washington. The fear is that Australia would be powerless to prevent such an eventuality, so that no such assurance can be provided. The full text of the letter can be read here.